← NACCHO #Aboriginal Health #Ice News : How does ice use affect families and what can they do? ” The cartoon by Leak, published by The Australian newspaper in August and criticised by some Indigenous leaders as an “attack” on Aboriginal people, was an appropriate portrayal of some communities. ” The son of the West Australian Police Commissioner has been sentenced to more than three years in prison for bashing his former partner 18 months ago. Russell O’Callaghan was high on a combination of drugs when he repeatedly bashed and threatened to kill his former partner in front of their five-year-old son. “In the days and weeks after The Australian newspaper published a cartoon that is now central to a debate about free speech, social media feeds were flooded with some gorgeous pictures. Using the hashtag #IndigenousDads, Aboriginal fathers and their children posted family photos: black and brown dads and their kids in happy snaps. 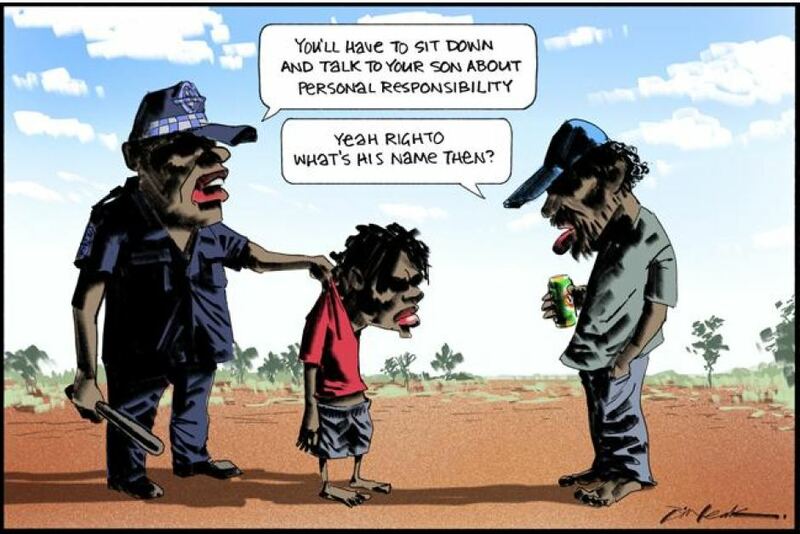 A controversial cartoon by Bill Leak depicting an Aboriginal man with a beer can who does not remember his son’s name is an “accurate reflection” of what police see in the field daily, according to WA’s top officer. It comes after four boys were charged with trashing a high school in the Goldfields city of Kalgoorlie at the weekend. “So we ended up, for many hours, looking after that child, trying to find a responsible adult,” Commissioner O’Callaghan said. Commissioner O’Callaghan said he believed it was a “generational problem”. “I think the problem is so widespread and so protracted that it’s not easy just to solve it with, you know, regular government services,” he said. “While people are trying to deal with the families and deal with things like substance abuse and alcohol abuse … those kids are still running amok in the community, creating havoc, damaging things, getting in trouble with the law. The attack at Kalgoorlie Boulder Community High School came just days after stage one of a $45 million redevelopment of the campus was officially unveiled. Bill Leak is, presumably, enjoying his status as a one-man outrage generator. Why he’d want to be that person is unknowable. There is a case for not acceding to his desire by giving his work free publicity and leaving it known only to the demographically specific readership of The Australian. Faint hope though. The giving and accepting of public outrage run in a recursive loop now; both parties to the bargain get the emotional feed they seek and the media gladly accept the bonanza of cheap and easy content generation. Which brings us to Leak’s extra-special cartoon effort from August. Inevitably, someone has lodged a complaint with the Australian Human Rights Commission that the cartoon’s publication contravenes section 18C of the Racial Discrimination Act. The AHRC is currently attempting to mediate a resolution. I expect this one will be heading to court. The cartoon doesn’t bear much analysis in terms of its contribution to civic debate, but should the law prevent it? It is unlawful for a person to do an act [which] is reasonably likely, in all the circumstances, to offend, insult, humiliate or intimidate a group of people; and the act is done because of the race, colour or national or ethnic origin of some or all of the people in the group. a fair comment on any event or matter of public interest if the comment is an expression of a genuine belief held by the person making the comment. If you read all that and wonder how it is that any complaint under 18C could ever succeed, well, yes, exactly. In fact, there have been few successful claims. I am trying desperately to write this without giving Andrew Bolt any more oxygen, so just a reminder that the sole reason he lost his 18C case was that the Federal Court found the 18D defences to be unavailable to him because he had not acted reasonably and in good faith. A more interesting reference point for Leak’s case is another cartoon that triggered a big 18C fight. In 1997, a cartoon in The West Australian newspaper provoked a complaint that went all the way to the High Court. The cartoon referred to Yagan, who was an ancestor of the Nyungar indigenous group; there had been a controversial legal case over the return of his head from the UK, which was a big story in WA at the time. The cartoon sought to make fun of the subject with what I guess the cartoonist saw as some sharply pointed observations. As with Leak, the Yagan cartoon sought to draw an unsubtle counterpoint between social/political theory and a particular viewpoint on Aboriginal lived reality. After a contested hearing, the Human Rights and Equal Opportunity Commission accepted that a reasonable person of Aboriginal descent would have found the cartoon offensive, insulting, humiliating or intimidating on various grounds, including the demeaning portrayal of Yagan, derogatory references to the spiritually significant Wagyl figure, treatment of death in a way that is offensive to Aboriginal people and reinforcement of the stereotype of Aboriginal people taking advantage of government grants. So the cartoon did trigger 18C, but it failed to clear the hurdle of 18D. It obviously being an “artistic work”, the only question was whether the publisher had acted “reasonably and in good faith”. The commission said it had. This is the critically important point about 18D — it’s a really high bar. The test from an earlier case, which the commission applied, was that to find a lack of good faith “requires the Commission to identify conduct that smacks of dishonesty or fraud; in other words something approaching a deliberate intent to mislead or, if it is reasonably foreseeable that a particular racial or national group will be humiliated or denigrated by publication, at least a culpably reckless and callous indifference in that regard.” Carelessness or casual indifference won’t suffice. The Nyungar complainants kicked on to the Federal Court and then the full Federal Court. Both courts found that the commission had applied the correct legal test, and the appeals failed. The saga ended finally in 2005 when the High Court refused special leave to appeal to it. The law hasn’t changed. The same principles will be in play if and when Leak has his day in court. It’s not a radical prediction to say that the cartoon will be found to fall foul of 18C; it’s patently offensive to Aboriginal people and directly targets them and nobody else. The only question will be whether Leak and The Australian acted reasonably and in good faith. And there, in my opinion, the case will certainly fail. Leak’s cartoon is repulsive, pig-ignorant bile that was designed to hurt an already marginalised racial group and achieved that aim. However, in doing so, he was simply expressing a bigoted opinion, not telling deliberate lies. Our racial vilification law, in the combination of 18C and 18D, sets a tough test. It favours freedom of expression, in the forms that 18D specifies, over the protection of racial and ethnic sensitivities no matter how acutely they are felt. In this way, we stand somewhere between the freedom to engage in hate speech, which the US constitution preserves, and the extensive restrictions on expression, which most of post-Holocaust Western Europe considered necessary given its history. Australia’s law leaves the field open for cartoonists, humourists, columnists and bloggers to express their prejudices and only risk a problem if they stray down the Bolt path of making stuff up. The status quo is equally unsatisfying for both sides of the outrage industry. The agents of outraged sensibility are barking up the wrong tree if they think 18C is a potent weapon for curbing racist expression in Australian public discourse. And those demanding repeal or amendment of 18C obviously haven’t read 18D or don’t care to. That equivalence of unhappiness is a sure sign that we’ve got the balance right.